BEAMSHOT COMPETITION! w/ prizes :) anyone can enter (**ENTRIES CLOSED**)! Re: BEAMSHOT COMPETITION! w/ prizes anyone can enter (deadline 11/18)! yeah i agree about getting a good shot, mine where all pretty crap, gunna have to get a helping hand i think. ive been using a DSLR, i must have lost the setting i had been using cause the photos came out crap. It seems like the 445's steal the show too. Ill attempt it again soon, i just received one of those o-like 400mW 532's, that should go well in the shoot. Nice job Swimminsurfer256, this is a great idea! Those are sweet pics posted also, entered or not. I imagine judging this is going to be tricky though. There's a lot of variables to think about when it comes to the best picture, but I guess since everyone's eventually going to vote then we'll see. How did you get that through customs? Im guessing thats the one you were telling me about over msn. my good mate Clif came up with a awesome way to get it passed. The guy or gal at customs would of been like: Wtf is this supposed to mean? meh, il just let it through. 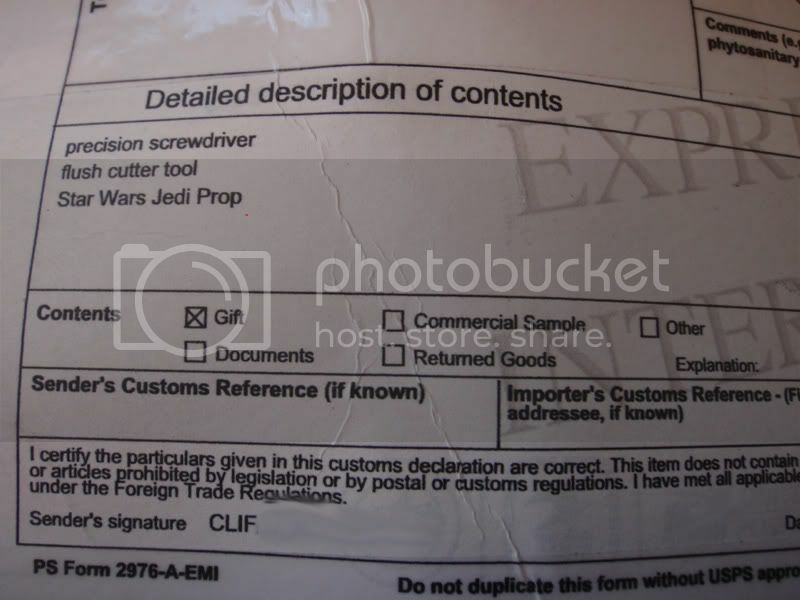 Haha, hopefully the customs officeres where stars wars fans and they where like "STARWARS FTW!" then did the wokie call then let it through. ill let you know too, it was just the main body he sent, so ive got the lens/head and tailcap coming in a second package too be tricky. if Clif did it for me he can surely do it for you! flick him a email, he's great to talk to. 589nm goodness. Its like a mini sun. Bahaha, what happened when you run into him? did he yell at you?